What would the economic impact on a future energy system be if one were to unlock the full solar thermal potential in Austria, Denmark, Germany and Italy? 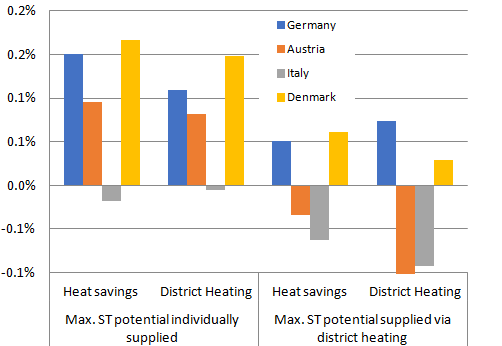 According to a study conducted by Aalborg University as part of the IEA SHC Task 52 research project Solar Heat and Energy Economics in Urban Environments, exploiting the maximum potential will result in significant cost reductions if solar heat is supplied not individually but by district heating. The graph shows small changes of between -0.1 % and +0.2 % in total socio-economic cost both in the District Heating scenario (expansion of district heating grids) and the Heat Savings one (retrofits reduce heat demand in buildings) when the maximum solar thermal potential is realised by using either decentralised solutions or district heating to supply heat to consumers. The key factor influencing the outcome is the cost of solar thermal systems. Aalborg University’s assessment of solar thermal’s role in a future energy mix was already reported on in this article. The Task 52 researchers considered all energy costs needed for installing solar thermal systems according to potential, namely infrastructure investment, operation and maintenance, fuel and CO2. What their calculations did not include were taxes, subsidies and external factors, such as added health costs or expenses for implementing climate change mitigation and adaptation measures. The main conclusion one can draw based on the above chart is that setting up installations according to the maximum solar thermal potential will result in higher socio-economic cost across all countries and scenarios in areas where heat is supplied individually. 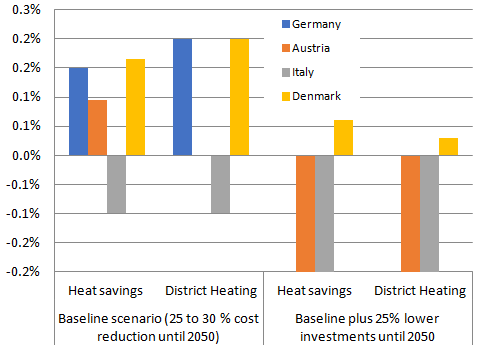 If district heating is used, solar thermal can be regarded as cost-neutral, with some scenarios showing a cost increase, while others see a decrease. There are notable differences between countries: For instance, in Austria and Italy, the use of solar district heating can lead to cost decreases thanks to cheaper production and, in Italy, higher solar resources. Denmark and Germany show a slightly higher cost of implementation, not least because, quite often, solar thermal replaces comparatively inexpensive fuels, such as biomass. In absolute figures, the cost saving in Italy adds up to EUR 0.2 billion a year in the Heat Savings and to EUR 0.3 billion a year in the District Heating scenario. The largest increase can be observed in the Heat Savings scenario in Germany, where the cost increases by EUR 0.7 billion per year. The study also involved several sensitivity analyses to explore how outcomes change when assumptions and parameters are modified. One key finding has been that the main reason for cost differences in the countries studied is the solar heat price. This price depends on how much must be spent on the solar thermal system (see table 1.) and how great the solar irradiation is at a given location (see table 2). In addition, the researchers determined that fuel price fluctuations do not change overall scenario cost, because their effects are quite limited in relation to the total. The chart below shows the impact of solar heat prices on overall socio-economic cost in two scenarios. The baseline scenario assumes solar thermal price reductions of 25 % to 30 % by 2050. The second scenario assumes an additional 25 % price drop partly prompted by investment cost reductions and partly by efficiency increases. Most of the scenarios show improved cost-effectiveness if the investment is reduced by those additional 25 %. The article was written by Riccardo Battisti, a solar thermal consultant and market researcher working at Ambiente Italia (Rome, Italy).